Well what can I say but no one here can believe it is winter! We are having perfect weather daily with virtually no swell, light wind and plenty of sunshine. We have had days with temperatures peaking 28c but cool evenings and mornings making this a perfect environment. Winter should be here already with regular cold fronts rolling in but you can never predict the weather these days. Due to the ‘summer’ weather, there is not much current or much change with the shark activity. The sharks cannot seem to make their minds up whether to hang around at the Island / Shark Alley or the beach (Summer behaviour). We are having plenty of sharks but have to move around daily to find them. The visibility is generally much poorer at the beach (average 3m) than the Island so we are hoping for the weather to change to shake things up a bit. We cannot complain however as we have had stunning shark activity and over the last 7 days we have averaged 11 Great White Sharks per trip!! Due to the bad visibility the sharks have been feisty and very active around the boats and virtually breaching out of the water going for the bait which is a spectacle to watch! 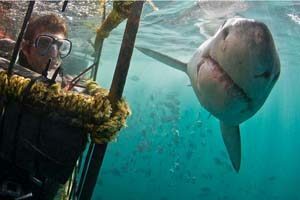 The largest shark seen this week was a whopping 4.5 metres in length. When you see one this big you will quickly realise the difference in size between a 3m and a 4.5 meter shark with its girth! Fun times in Gansbaai for all! !